I sat at my computer writing this blog, but there was a hitch: there was too much to write about our travel to Southern Africa. 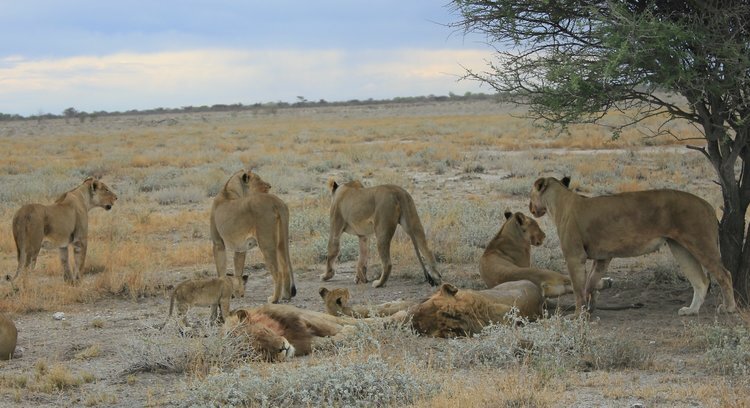 Therefore, I decided not write about all that spectacular wildlife Africa is known for. Not about those zebra’s, elands, lions, rhino’s, wildebeest, giraffe, orix, springbok, blue cranes, hornbills (and that is only the beginning of a long list) we have seen up-close in Namibia. Not about the dassies on Table Mountain, not about the African penguin, seals and dolphins we saw around the Cape. Much has already been written about these animals, but trust me: words cannot describe the sensation of experiencing this wildlife close-by in the raw nature of Africa. But don’t worry, keep reading….. Flying in the Airbus 350 from Singapore to South Africa high above the Indian Ocean the sun rose. It was catching up with us, giving a very slow deep red sunrise. I was staring through the window and wondered if all that travel made me bland, but when I felt this excitement when we arrived in Windhoek, Namibia, I knew it was not. This land in its own way had something raw about it. Here the distance was all but impossible to estimate and measured in driving hours. Namibia was a big chunk of empty earth. 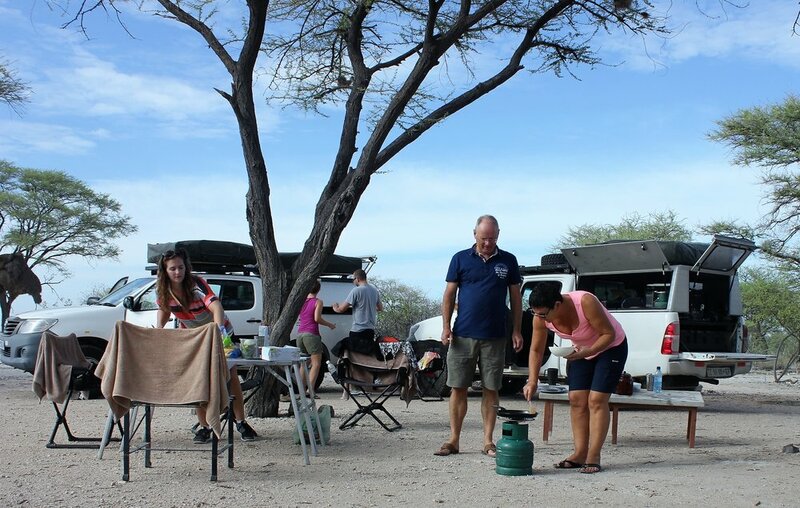 Francien, Winnie, Brad, Marcella and myself drove in our two 4x4 cars to the north and stopped a few days at a game lodge run by German speaking Namibians. A single railroad track cut through the 15.000 hectare farm and the ‘Süd West Kaiserliches Eisenbahn Kommando time table 1902 Swakopmund – Windhoek’ hanging in the lobby was a reminder of the Germany history in this part of the world. We watched a bush wedding of white Afrikaans-German speaking locals. They were tall and rather obese people. The priest with a long scruffy beard, carried a 15 cm thick bible and conducted the ceremony. Warthogs and antelope were foraging just a few meters behind the makeshift altar and those goofy looking guinea fowls made screeching loud noises. As there were no carnivores on the farm, it was safe for us to hike through the bush, taking is close to the wildlife. The two rhino’s roaming the farm were 24/7 protected by an armed guard on a quad. Unfortunately poaching is a real problem here. While making small talk to the lodge manager, Claus said: ‘we do not welcome Chinese guests to our lodge as we are not sure if they really come with good intentions!’. In the newspaper later that week I read an article about seven rhino horns, bound for the far east, confiscated at the Johannesburg airport! Camping-safari is our kind of vacation. 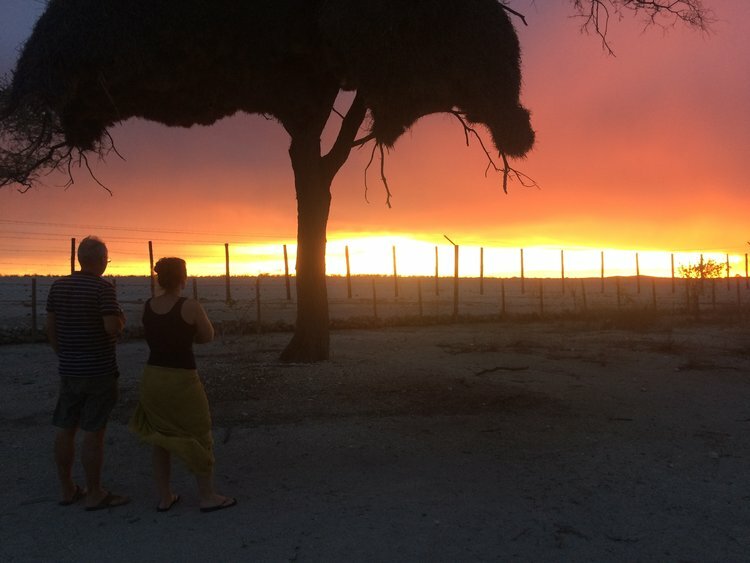 Etosha National Park is as big as Switzerland and it felt as if we had the place to ourselves. The overnight camps we stayed in were fenced with two-meter-high wire, but we still felt immersed in nature. At each camp around 20 campsites were occupied with 4x4 vehicles with tents. There was little vegetation, save for wild grass and camel thorns. The petrol stations at the camps were mere dilapidated brick buildings with a few old pumps inside. In one camp the attendant only could say: ‘diesel finish, diesel finish…..’. The locals at the camps were not very motivated, unorganized and efficiency seemed to be an unknown word. But somehow all worked out. Bringing an extra portion of patience is part of the authentic experience. I hope that will remain like that. In Namutoni camp banded mongoose foraged around the campsite and elephants had broken through the fence (dung inside the camp), but nobody seemed to bother. In a book at the reception visitors marked their wildlife sightings (one herd of 60 elephants was spotted! 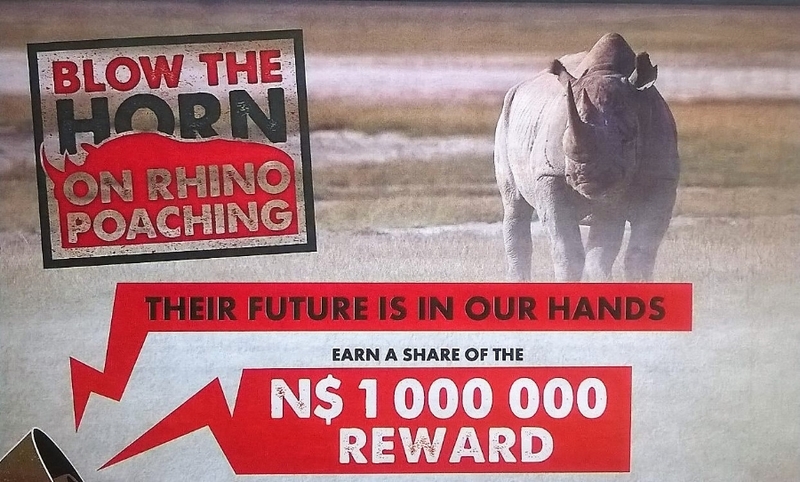 ), but were asked not to write down any rhino sightings to help protect those animals from being poached. One night I jumped out of my bed, woken up by the loud howling of a jackal just a few meters outside our tent. The cacophony of hornbills and weaverbirds was our daily wake-up call. With our two 4x4 cars we drove on the gravel roads looking for animals on the wide plains. At times the intense heat seemed to turn the horizon into water (Fata Morgana). The 150 Km long white Etosha saltpan stretched as far as you could see and looked hostile and intimidating. The air was hot and dry. One afternoon a small twister cut across our campsite and threw them on the ground. The next day another twister blew over a few tents on the camp site. 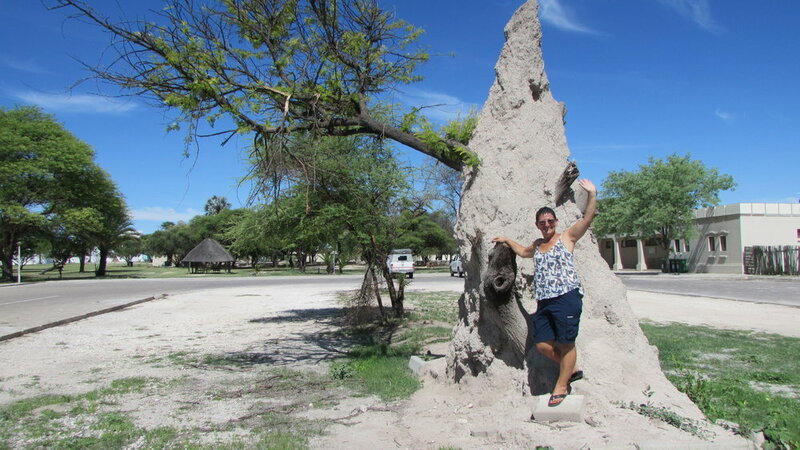 Our dishes dried within minutes in the sun and so did our hand-washed clothing and towels we hung in the acacia trees. We had to wait to put up our rooftop tents until late afternoon, because the metal ladders and cover sheets were too hot to touch. After a few days we all started to slow down our movements and eat less and to help us to stay cool we drenched our leather hats in water. And then, for a few moments, we all were silent in awe as we watched the sun go down in red and gold colours over the bushveld. This was one of those magical moments of this trip. We had no Wi-Fi for days, only one bar left on our batteries. Who cared? We had not really missed anything, but gained a lot! Back in Windhoek at the airport waiting for our flight to Cape Town our fellow travellers were not your average tourists: adventurous looking backpackers hauling rucksacks, some with long beards, hiking boots, big worn safari hats. 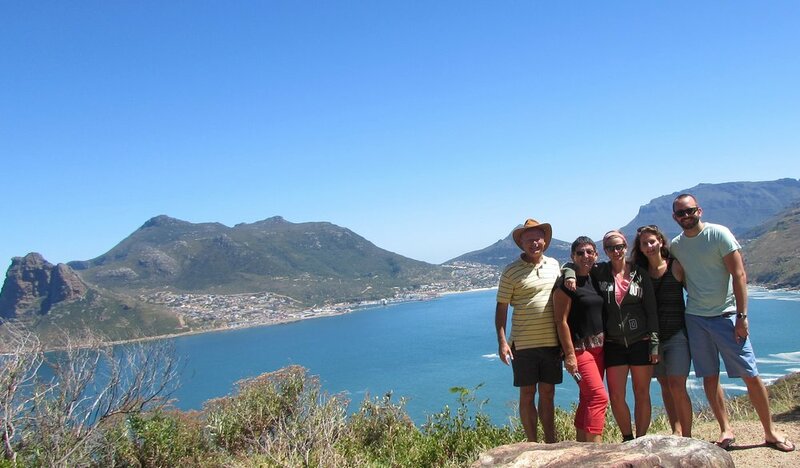 Cape Town is a blend of heritage, spectacular scenery and white, black and coloured local people mixing with tourists from all over the world. The pentagon shaped Good Hope Castle with its VOC arms (much the same as we have seen in Malacca, Malaysia) and of coat of arms of the Dutch cities Enkhuizen, Amsterdam, Haarlem, Rotterdam above the entrance was a reminder of the impact the Dutch had on this part of Africa. A visit to the former slave lodge, showing very realistic how slaves were treated was very intense! The tombstone of van Riebeeck and his wife, and the engravements of Hoorn and Amsterdam were further witness of the Dutch involvement back in the 17th century. Walking through the streets we saw many homeless people: a black women lay on the pavement and was pulling her dreadlocks out, a grey dirty looking man was happy when we gave him our doggy bag coming out of a restaurant; ‘God bless you’ he said with a smile on his worn face. People were sleeping on pavements, some scavenging trash bins for food. Four 10-year old kids performed a dance in street for money, but were chased away by one local shop owner. We donated to a charity for orphans in city center. Yellow clad public safety attendance from CCID, armed with radio’s, walked the streets, effectively preventing street crime during the day. But at night we were advised to get around only by car! Thank goodness Uber (we use in Kuala Lumpur) works perfectly well in South Africa. Strolling around the parliament buildings and company gardens, it struck me that so many old names and monuments were still there: Statues of Louis Botha, Cecile Rhodes, Jan Smuts. Acknowledging the past for what it was, is part of the reconciliation process which is still taking place in the country. 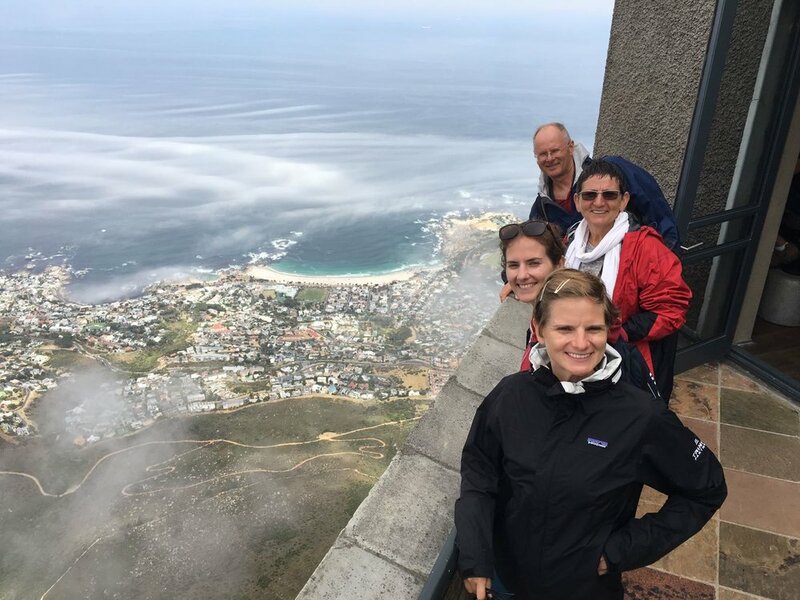 Starting at a 300 meters elevation, we hiked on the Platteklip Kloof path steep up the iconic Table Mountain. As the five of us climbed up, the air cooled down. 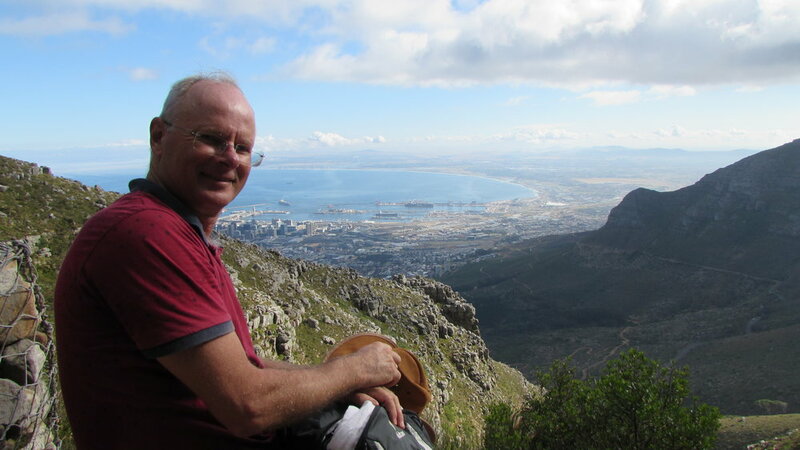 We enjoyed the earthy smell of the fine-bos and while taking short breaks, gazed down onto the city bowl with Robben Island as a mere dot in the sea in the far distance.The upper half of the mountain was shrouded in clouds and we were not sure if we had reached the top until we saw a small sign: ‘1080 meters above sea level’. The cold wind broke up the clouds and gave us a commanding view across the city bowl and the mountains running south to Cape Point. I do not know how anyone could fail to experience that excitement that comes with standing on top of Table Mountain! The first days reminded us so much of our time living in South Africa. In particular the accent felt so familiar and welcoming. All people were smiling, talkative and appreciated some sarcastic humor. We enjoyed competent service in the restaurants. South Africa would not be South Africa without kingklip, rooibos tea, Ouma rusks,biltong and boereworst. To my taste buds, the best steaks in the world are from here! When asking people for info in the shops and on the street they generally could help us (unlike KL where they never know anything) or at least tried to find out. It was great to meet up with friends we met around the world, rooted in South Africa. Brad is a hobby stand-up comedian and performed at a comedy-night show at Sgt. Pepper Club in Cape Town: whites, blacks, coloured's, Europeans, Canadians, young and old. A very diverse mix of people and indeed a very provocative comedy! Here we felt much easier to blend in with the locals as in Kuala Lumpur, because of the western culture, the English and Afrikaans language and the positive attitude and sense of humor of the people. 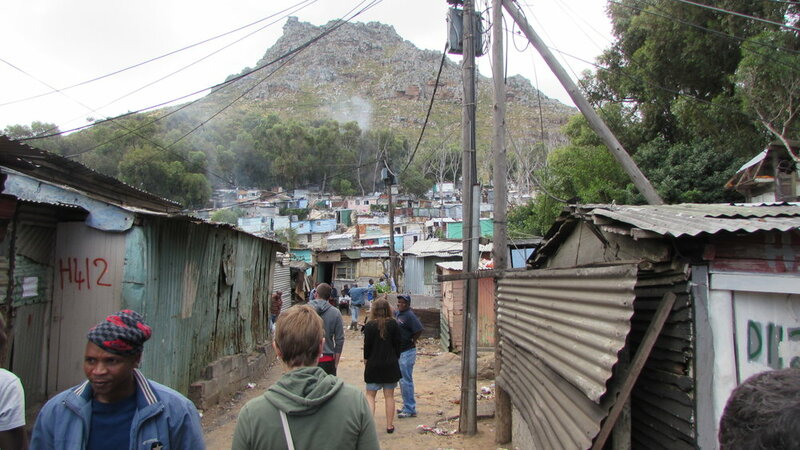 In Hout Bay, a small fishing village 25 Km south of Cape Town, we only saw local tourists. Here we visited Imizamo Tethu township. Originally built for 2500 people, it now is home to 40.000 people from 15 different African nations (many refugees from Zimbabwe, Somalia, Mozambique). With Moni our guide we walked through the streets, alleys and between the shanties. It was the day before Christmas, a public holiday and we heard loud African music coming out of so many shacks and the people singing and moving on the rhythm of the music. Some lived in self-made boxes of corrugated iron, blowing with plastic litter. We walked past hair salons, shebeens (pubs), convenience stores, schools and government built brick houses. Walking further into the township we stepped over a dead rat on the street, watched four sheep heads on a fireplace, trash dumped at some central locations waiting to be collected. Washing was hanging everywhere. Up in the air a spaghetti of (illegal) electricity cables and many satellite dishes on the roofs. It seem all have TV inside, but no running water which they collect from water platforms built by NGO’s. It is there were we see women do their hand washing. People dressed in white gowns attend a church service in a make-shift church. 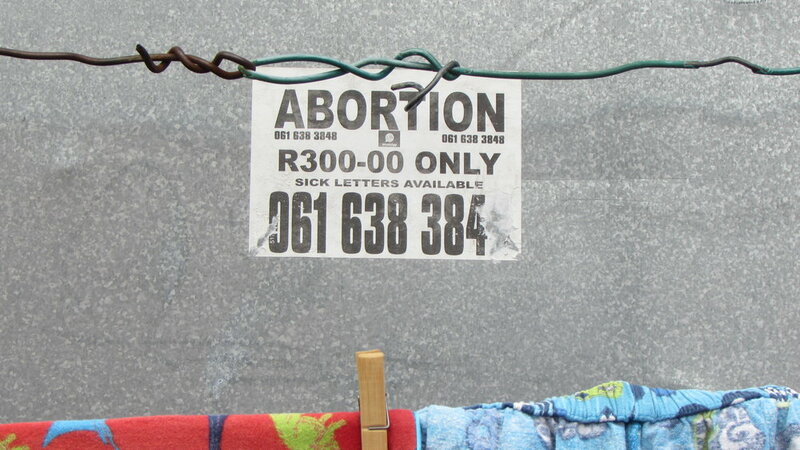 Pamphlets hanging on fence saying ‘RSA 300 for an abortion’. Young men hang around, drinking beer even before lunch time. Everyone seems to have a smart phone. People greet us: ’where are you from?’ the most asked question. The unemployment rate is 40% and those fortunate enough work as security guards and maids in the wealthy parts of Hout Bay. ‘For some businessmen people from Zimbabwe are preferred workers’, Moni murmured while strolling between the shanties ‘causing friction with the locals here in the township’. This society was still scarred by apartheid. I saw an old woman sitting on a bench in front of her shack. She lived the period in which laws dictated where she could live, work, eat and educate her children. Africa is a hard-edged place. Leaving the township behind, only after a few-minutes-drive on the windy roads, we emerged ourselves in a totally different world: -Say W for wine- Cladded to the Cape mountains we saw rows upon rows of fresh green, vines, the sun beating down from the deep blue African sky. Cape Dutch manor houses (some dating back to 1685) dominated the wineries. Eager to taste the wines, we visited Groot Constantia and Buiten Verwachting estates. We sat on charming lawns amid colourful flower gardens, sipping our favourite wines of choice. Cheers! Although 9% of the population in South Africa is white, here at the wineries, but also in the airplane, in the hotels and restaurants we saw mainly white people. People are equal by law and different by economic status and therefore still living in segregated worlds. This is true across the world. We saw many parallels with Europe, Middle East, Malaysia: the people talk about better border controls to keep refugees out, discuss how different population groups can live together, are appalled at the crony networks (or some called it establishment) around their leaders. We are all afraid one group dominating the others and talk about (in-) competence of people of different groups when trying to explain why one is economically more successful than the other. We all have much more in common than we think! I enjoyed reading about this and other good-news stories in the local newspapers (Cape Angus) in one of the many coffee shops, a welcome change from the very poor quality newspapers back in Kuala Lumpur! Cape of Good Hope. We found the place Francien and I stood in 1982. Again we were at the edge of Africa, to the south Antarctica, to the west Argentina, to the east Australia. Back then we were virtually alone standing on the 200 meters high cliff jutting into the ocean. Today a funicular took thousands of selfie-stick wielding tourists from all over the world. The strong south easterly wind gusts almost knocked us off our feet. We smelled the ammonia stench from the cormorant’s colony stuck to the cliffs and watched the seals play in the surf down below between the rocks. The deep blue white capped ocean looked threatening and dangerous – that sounds dramatic, but believe me it was! If there is another memorable moment I have to mention during this trip, it would be here at Cape Point. But thank goodness, I do not have to. Africa crept underneath our skins 35 years ago and we have felt it again! Alas, all things come to an end. With our heads full of impressions and bodies stiff after a 24 hour flight back to Kuala Lumpur, it made Francien and myself realized how privileged we are to experience all this! Older PostWhy is Cyprus our home base?